What is Obesity, Morbid Obesity? The fundamental cause of obesity is eating too much and very little physical activity. When an individual consumes large quantities of food that is unusually high in sugars and fats and does not burn it off through exercise and physical activity, this surplus energy is stored in the body as fat. The energy derived from food is measured in units commonly known as calories. Typically an adult male requires 2,500 calories a day, and an adult female needs 2,000 calories a day to maintain a healthy weight. Some foods have higher calories than others. Eating a burger, fries, and milkshake quickly adds up to 1,500 calories in just one meal. The important thing, therefore, is to focus on maintaining a healthy and nutritious diet to ensure a healthy consumption of calories. When individuals consume a lot of calories and are not physically active, these calories are stored up as excess fat in our bodies instead of being burned up as energy. Eating a lot of fast food or processed food which is usually high in fats and sugar.Eating out frequently in restaurants and cafes rather than consuming home cooked meals. Eating out often in restaurants and cafes rather than consuming home-cooked meals. Eating large portions that you do not need. Consuming too many sugary drinks such as soft drinks and fruit juice. The main culprits found in a bad diet and lifestyle choices are too much sugar and saturated fat in our diet. Sugars that are added to food and drinks. These include sweetened breakfast cereals, flavored yogurts, sugars in biscuits, chocolate and fizzy drinks. This is irrespective of whether the free sugars have been added by the manufacturer, chef or at home. Sugars that occur naturally such as nectars, honey, and syrups, e.g., maple, golden and agave, vegetable juices and smoothies and unsweetened fruit juices still count as free sugars. The sugar that is found in milk, vegetables, and fruits is not classified as free sugars however they still add up to the overall sugar intake in our diets. Consuming foods that are high in saturated fat can raise your cholesterol levels and increase your risk of heart disease. Saturated fat is found in: ice cream, cheese, pastries such as croissants, pies, sausage rolls and quiches, bacon, sausages, cakes, biscuits, fatty cuts of meat, cured meats such as salami, pancetta and chorizo, suet, lard, butter, coconut oil, ghee, palm oil, milk shakes, chocolate and chocolate spreads, coconut milk and cream. Health guidelines recommended that an adult male should not consume more than 30g of saturated fat a day while an adult female should not consume more than 20g of saturated fat a day. A substantial factor contributing to obesity is the lack of physical activity or leading sedentary lifestyles. A typical day for most people involves sitting at a desk on their computer the whole day and traveling by car rather than walking or cycling. Also, relaxation and recreation activities typically tend to be watching hours of television, browsing the internet or playing computer games. Most people are not incorporating regular physical exercise into their daily lifestyles. This inactivity means that the energy converted from foods consumed is not used up and any excess energy is stored in the body as fat. Recommended activity guidelines for adults is at least 2 and ½ hours of moderate aerobic activity such as brisk walking or cycling every week. For obese or overweight individuals, more intense exercise than this is required to lose weight. There are some rare genetic conditions that cause obesity in families such as Prader-Willi syndrome. This condition is as a result of a genetic defect on chromosome 15 and results in various mental, physical and behavioral problems. A never-ending desire to eat more food due to a permanent feeling of hunger. Behavioral issues such as tantrums and stubbornness. Other genetic traits that can also run in families can be having an enormous appetite. 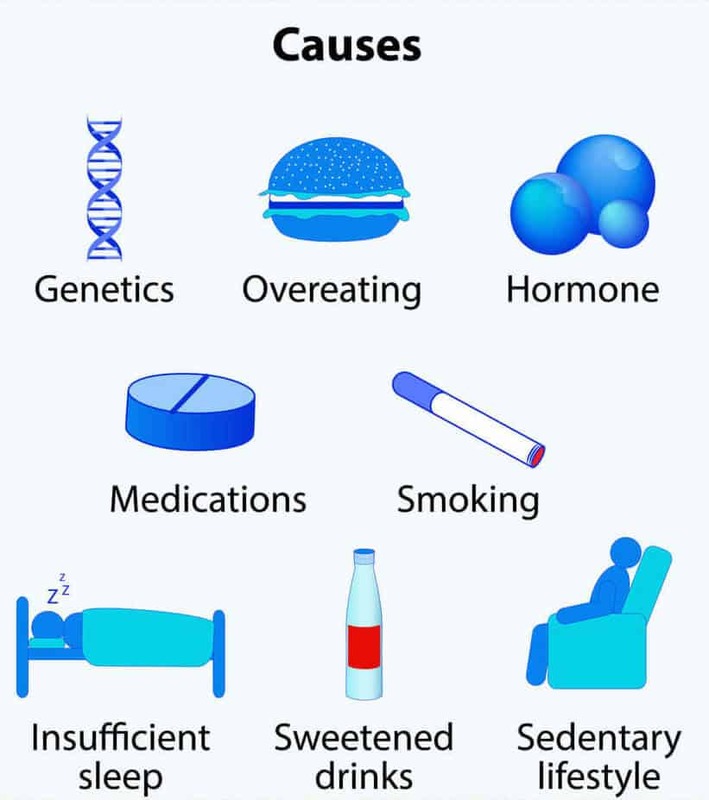 Despite these genetic factors, however, establishing and maintaining a proper diet and healthy lifestyles can help affected individuals to lead a healthy life. Some medical conditions can contribute to weight gain and lead to obesity such as an underactive thyroid gland and Cushing’s syndrome. Some medications such as those taken to treat diabetes, epilepsy and mental illness can also contribute to weight gain and obesity. Are you interested in undergoing bariatric surgery in Mexico from $3899? Renew Bariatrics is a weight loss surgery facilitator helping individuals seek affordable healthcare in Mexico. We are different from others by providing affordable procedures, holistic aftercare, and high-patient outcomes. Learn more about the Renew Bariatrics Center is different. Experience the Renew difference. *Individual results are not guaranteed and may vary, please refer to our disclaimer page. This content is not intended to be a substitute for professional medical advice, diagnosis, or treatment. Always seek the advice of your physician or another qualified health provider. Copyright © 2019 Renew Bariatrics, Inc. Renew Bariatrics, Inc. is a medical tourism scheduling facilitator, not a healthcare provider.